You guys! I'm so excited for Valentine's Day this year! I don't think I have ever given Valentine's a second thought really, in fact back when I was deciding on which college to go to there was an anti-Valentine's-Party sign that was involved in the final decision making. But this year I've been excited since the beginning of January! What's my deal? Maybe it's because I've been watching the Bachelor and super cheesy love songs like "Kiss From A Rose" have been stuck in my head—or maybe not. 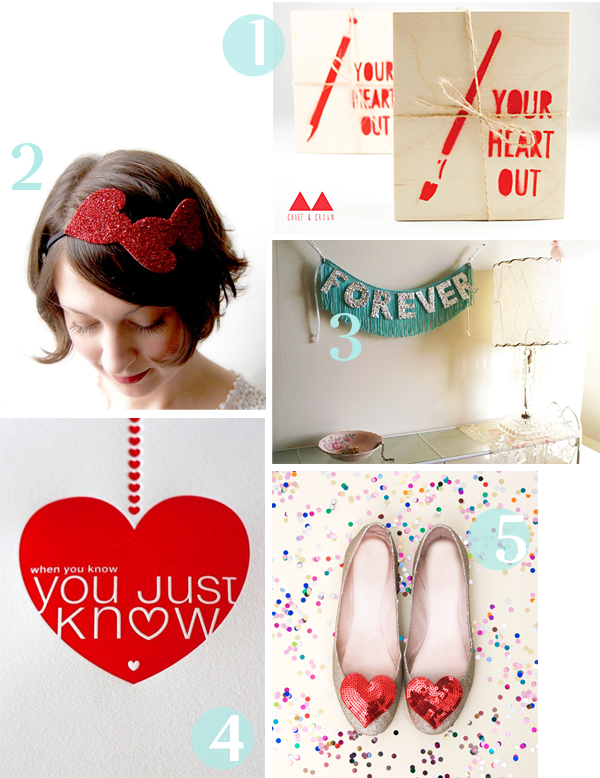 Because I've had hearts and glitter and red and happiness on the brain I decided to put together a little sampling of items I have fallen in love with this Valentine's season. I'm thinking each and every one of them would make a fantastic little Lover's Day gift....... I sooooo hope Jas didn't miss that subtle hint. oh so cute!! i'm usually not a valentine's-y person either, but this year i'm feeling extra mushy, too! must be something in the tortillas at the taco bus! But it's a cute day for couples, of course. This is all so cute! I've never been a fan of V-day, but this year it's kind of exciting! Geri, I'm cyber-barfing right now. Don't take it personally. I'm just not a Valentine's Day fan...must be the lonely spinster coming out in me. But, I do think that if I did ever decide that Valentine's Day was okay I'd really like all of the things you showed...they are cute. I too have never been a big fan of valentines day and its only really just taken off in New Zealand in the last few years ... but your little collection is cute! geri!! this is brittany...from ceramics class a long time ago...don't know if you remember me, i've just been blog hopping and i landed on yours! it's so cute and chic and artsy i love it! adorable selections! can't wait till cupid comes to town! Last year I did the 14 days of valentines for Jonny. It was fun! Maybe since you are so excited for V-day, you should do it for Jason. Just a though. & i am SOO excited for valentines, if only mostly for those pink m&m's... and more kisses than usual. mmm!